In order to win big, you must play big. If I doubled my money, I would walk up to the Mansion and demand a table. Not today. Instead, I walked up to the hostess at L’atelier and demanded to be seated or else! And it worked! Yah, right. I don’t have the balls to do that. I don't want to be blacklisted from Mr. Robuchon's world! He holds the key to the Mansion. We waited about an hour and half for a seat at the bar at this beautiful and sleek restaurant, filled with black and bright red accents, and colorful fruit and vegetable shape decor. Because we were seated at the section for poor planners who do not make reservations, I thought we were going to be treated like second-class citizens. Really? Who sits at the counter at a French restaurant? But, in Mr. Robuchon’s world, this bar seat was the best in the house! At most fine dinning restaurants, I always feel like a 8 year old kid, wearing her mommy's dress, heels and makeup, looking ridiculous, sitting nice and straight, drinking water with her pinky up, pretending to be an adult. 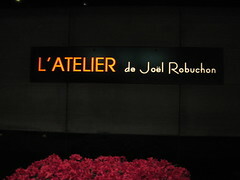 Instead, the bar seating at L'atelier created a world of unpretentious French dinning, removing the stuffiness yet creating warmth with the attentive wait staff and a view of the chaotic cooks working to provide delicious meals while fellow foodies take in each dish with all their senses. Amuse-Bouche- foie gras with port reduction and form Parmesan served in a shot glass. I took a spoon full and closed my eyes as the salty Parmesan, foie gras and sweet port hit my palette and partied in my mouth. Loved it. 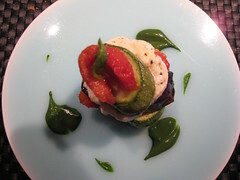 Les Legumes - Layers of tomato, eggplant, zucchini with Buffalo Mozzarella and dabs of Basil puree on the side. All the vegetables were well seasoned. Each layer of vegetables brought a different dimension to the dish. I loved the tomato confit. It was very sweet and flavorful. La Langoustine - Crispy Langoustine Fritter with Basil Pesto. 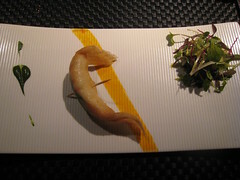 Tissue thin fried batter wrapped around a sweet Norway lobster. Yum. It was nice and crispy. Although, it tasted 100 x better after I figured out that the micro-salad had a purpose other than decoration. One piece of La Langoustine + a few piece of micro salad + a dab of basil pesto = a good favor combination of fresh, sweet and crispy. 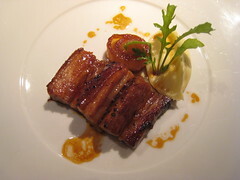 La Porc Fermier - Braised Pork belly with confit sweet onion. Sweet melt in your mouth pork belly. The mashed potato was really tasty. I can taste a heart attack waiting to happen. 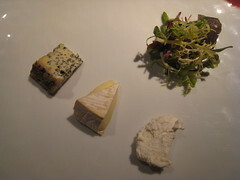 Les Fromages - Blue cheese, Creamy sheep cheese and Camembert. Although, the cheeses were awesome quality, I thought that this was filler, so I don't leave starving. I would have rather eaten something else. I wanted to try the traditional tarts, but they were sold out. 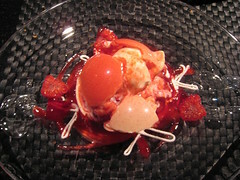 So, being difficult, I petitioned to substitute the assorted sorbet for the La Framboise - fresh raspberry inside white chocolate sphere, yuzu ice cream. It was a little too tart for me, but the sweetness of the white chocolate combined with fresh berries and the distance flavors of yuzu ice cream created a very distinctive unique flavor. I loved my meal and my experience. 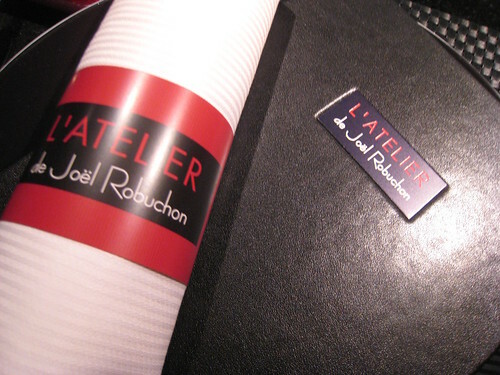 It was a beautiful window into Mr. Robuchon's world.